Trip Departures: Every weekend, April thru October and every Monday thru Friday, June thru August. Arrive after 5 PM the evening before your trip. Our 1 day trips include camping the evening before your trip and breakfast the next morning. After breakfast and a brief orientation, we will begin our 13 mile journey down the Lower Gorge of the South Fork American. 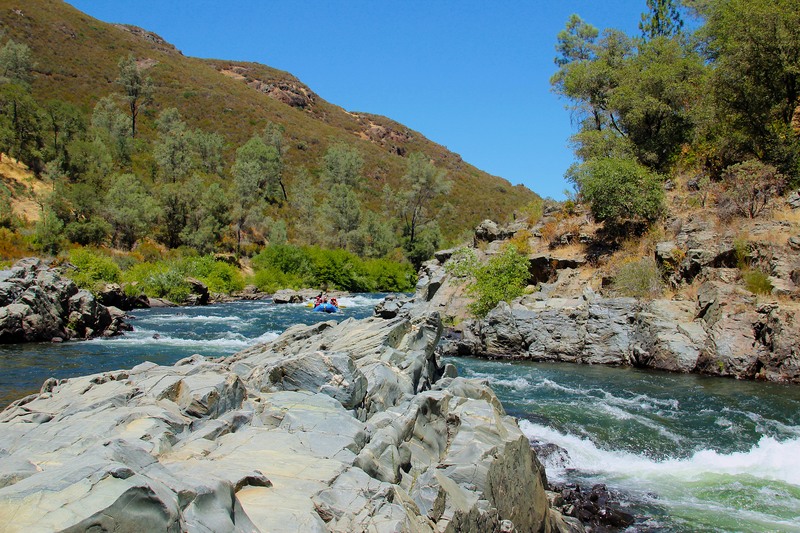 Our Lower Gorge trip begins at our camp as we float a swift but mellow section of the river allowing everyone to perfect their paddling skills in preparation for the challenging American River Gorge. After a delicious 'deli-style lunch we enter the Gorge where in quick succession we will bounce, yell, get wet and laugh through Fowler’s Rock, Satan’s Cesspool, Haystack Canyon, Bouncing Rock and Hospital Bar Rapids. Our journey ends on the warm, still waters of Folsom Lake where an awaiting bus or van shuttles you back to the meeting place around 4:30 PM. EarthTrek trips include camping the night before your trip and breakfast the following morning. 1 day South Fork Lower Gorge trips are scheduled to depart every Thursday and Saturday from Memorial Day to Labor Day. If you wish to book a Lower Gorge raft trip without camping or breakfast (meeting time 10:30 AM) please call our river partners at O.A.R.S. at toll free 855-499-3518 and they will assist you in making a reservation. 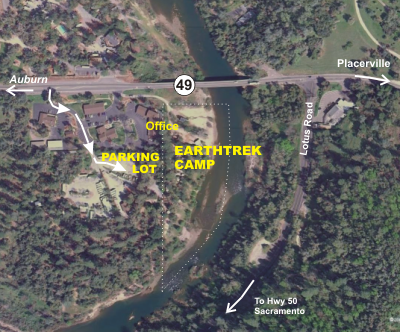 9:30 AM weekends or 10:30 AM midweek: Arrival time at our camp and check-in. Meet in our amphitheater for trip orientation, go over safety issues and meet the guides. Your guide for the trip will be assigned at this time. Stop for lunch at our private lunch where we serve deli-style make-your-own sandwiches consisting of ham, turkey, roast beef, cheese, lettuce, red onions, tomatoes and a selection of breads. Complimenting your sandwich may include sliced pickles, olives, garlic mushrooms, pepperchini's as well as a selection of chips and cookies. To quench your thirst we have ice cold lemonade, ice tea and water. Note: Depending on the timing of midweek water releases, we may serve lunch in camp prior to launching the rafts. When we reach Salmon Falls Take-out we will need to carry our rafts and gear up to our awaiting equipment van and trailer. 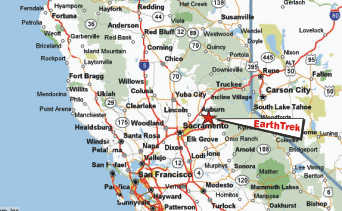 The distance and the climb fluctuates with the level of Folsom Lake. An ice cold soda or bottled water is waiting for you. Board our bus or van for the 15 mile trip back to our camp and the conclusion of the trip at about 3:30-4:30 PM. 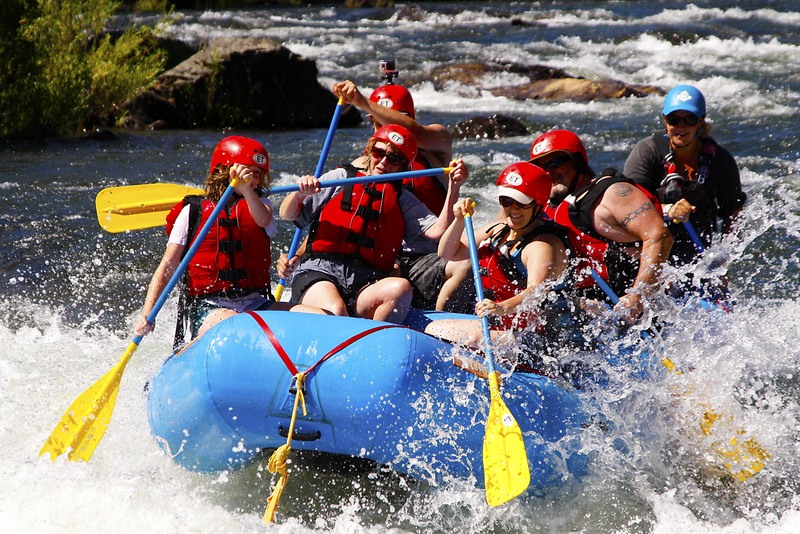 On the South Fork American we use self-bailing paddle rafts for maximum fun and excitement. Each of the 4-8 passengers has a paddle to help power and maneuver the raft while the guide steers and directs the crew. On high water trips or for passengers with special needs, an oar raft where the guide rows the boat, may be used. NOTE: Camping is not included on one day trips but you have the option to add camping to your trip for $10 per person per night. Our 1 day trips do not include camping or any extra meals, except lunch. 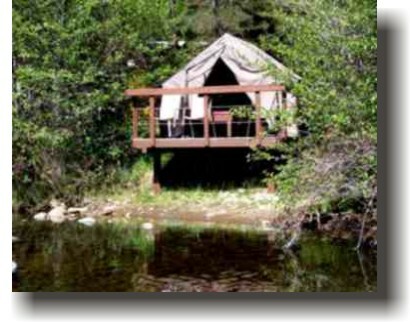 You may add camping either before or after your 1 day raft trip, or both nights. 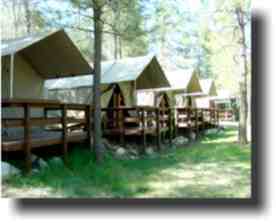 Our camping fee is $10 per person per night. If you add camping please arrive at 6 PM or later on the night before your raft trip. If you arrive prior to 6 PM your camping space or rental tent may not ba available as we need the period prior to 6 PM to clean tents and/or water our lawn. Please note: We do not allow individuals to cook their own meals so please do not bring camp stoves for food preperation. If available we can add breakfast and/or dinner to your package. There are several restaurants within walking distance of our camp. Our campground is not equipped for RVs. You are allowed to park your RV in our parking lot and stay in it at night but PLEASE do not run your generator from 10 PM to 7 AM. If you would like to stay at a campground with RV hook-ups check out our links page for a list of campgrounds in our area as well as motels and bed & breakfast inns. 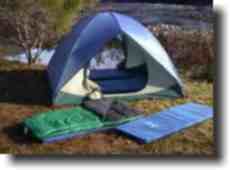 Bring your own tent, sleeping bag and sleeping pad or rent what you need from EarthTrek. See below. Camp gear rentals are in addition to our campground fee of $10/person per night. 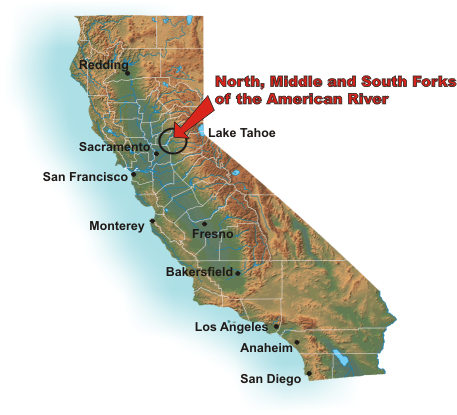 Just a note to say we had a wondeful experience on our whitewater rafting adventure with you on the South Fork American River. We had never been before and it was great! The entire staff was so accommodating, pleasant and reassuring. Everyone was as helpful as possible. We'll definitely come back and recommend EarthTrek to anyone who wants to have a great trip. We can't thank you enough.